The first recorded account of Edward’s life is on 02 June 1803 when he was 18 years of age. Edward had gained a good knowledge of the sea through working with his father on local fishing vessels and was a prime target for the dreaded press gangs. By early 1803, Britain’s war with France had resumed and the navy sent out the call for thousands of men who were summarily taken from their homes, trade and vessels to serve on Royal Navy ships. This was legally and brutally enforced, with the impressments law stating that “eligible men between the ages of 18 and 55 years” could be pressed into service for an unspecified period. According to the law, press gangs were not permitted to seize seamen on outward bound vessels, but there was no restriction on ships bound for home ports. At the time of the Battle of Trafalgar (21 October 1805) over half the Royal Navy’s 120,000 sailors were pressed men, including quite a large number of Irishmen. The details of Edward’s impressment remain a mystery. Some accounts indicate he was taken from his father’s vessel at Youghal although it appears more likely he was snatched along the coast in Cork Harbour. However we do know that he was held aboard the armed tender, HMS Louisa by a Lieutenant Kennan. The pressed men were transferred to the frigate HMS Dryad and taken to HMS Ville de Paris under Captain Tristram Ricketts which was engaged in the blockade of the Port of Brest at that time to prevent the breakout of the French Navy. Napoleon had amassed an army of 200,000 men with the intention of invading southern England. Hence the building of the Martello towers around the English and Irish coasts. Cork Harbour still has four very well preserved examples of Martello Towers. The muster book of HMS Ville de Paris records Edward Bransfield as being 19 years old and no bounty being paid (as he was an impressed man). He was classified as an Ordinary Seaman on an annual wage of £10 4s 9d of which he asked for £4 9s and 7d of which he asked to be deducted for his family. The muster book records he requested a £1 11s advance out of which he had to pay expenses for clothing issued to him on HMS Louisa. In today’s terms £10 4s 9d is worth approximately £500 or €575. So not only was he press-ganged against his will but he had to pay for the privilege as well. In little less than a year Edward Bransfield was promoted to Able Bodied Seaman. 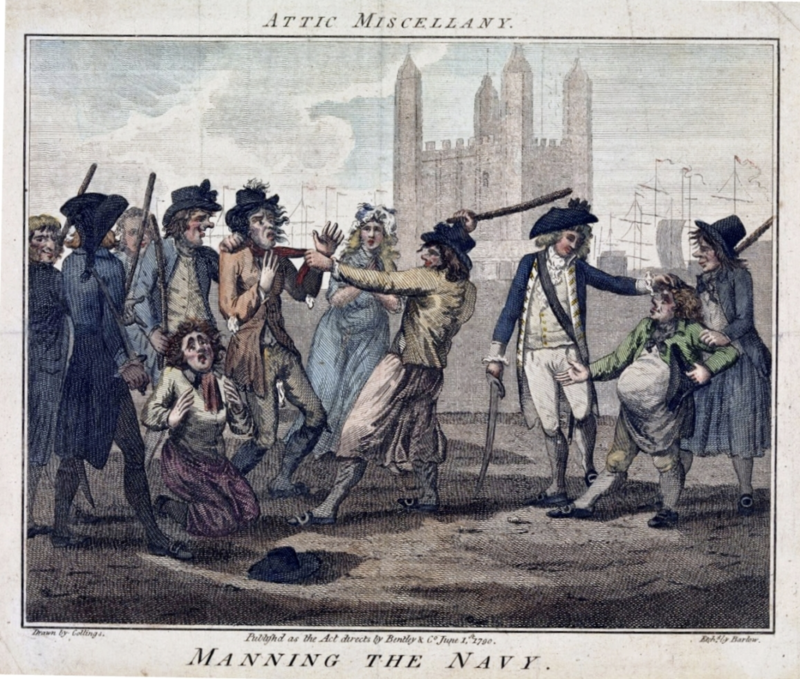 Though press-ganged, his intelligence and willingness to work must have caught the attention of his superiors and by 1808 he was promoted to Midshipman aboard HMS Royal Sovereign which he had joined in 1806. Because of his intelligence, experience and genuine aptitude he served as a Clerk and Quarter master and was transferred between a number of Royal Navy ships. Bransfield’s most significant advance came in 1812 when he was promoted to the rank of Master on HMS Goldfinch under the command of Captain E Waller. The promotion gave Bransfield responsibility for navigation and after less than a decade of service enabled him to assume the role of navigator in any Royal Navy vessel. The most notable event in Bransfield’s career so far came during the Bombardment of Algiers in August 1816. ) 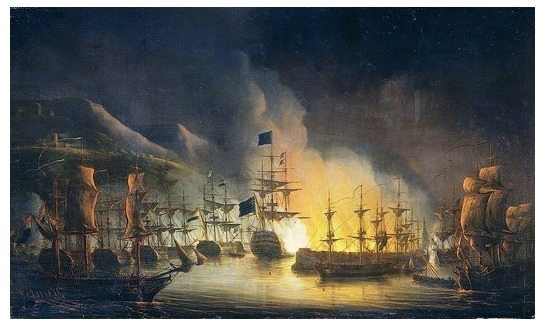 The Bombardment of Algiers, which took place on the 27th 27 August 1816, was an attempt by Britain and the Netherlands to end the capture of Europeans by Omar Agha, the Dey of Algiers. There was a continuing campaign by various European navies and the American navy to suppress the piracy against Europeans by the North African Barbary states. The specific aim of this expedition, however, was to free Christian slaves and to stop the practice of enslaving Europeans for ransom. To this end, it was partially successful, as they freed around 3,000 slaves following the bombardment and signed a treaty against the enslavement of Europeans. However, this practice did not end completely until the French conquest of Algeria in 1830. Edward Bransfield was Master of HMS Severn (44 guns) under Captain F.W Aylmer who hailed from a landed gentry family in Balrath Co. Meath, during the day long engagement. Taking his ship alone into the confines of Algiers Harbour under a flag of truce to deliver a note requesting the Dey of Algiers to surrender peacefully, Bransfield observed the forces lined up against his ship. The surrender request was refused and The Dey fired a canon in defiance which immediately led to the commence hostilities. The Royal Navy and Dutch fleet responded and in an early encounter Bransfield sailed close inshore to draw fire to allow the larger ships to engage. The battle lasted 9 hours and the keel and mast of HMS Severn were damaged. Over 9000 men lost their lives before the day was over, yet only 3 were lost on HMS Severn. The damage inflicted on the city and fleet of the Algiers forced the Dey to surrender and over 3000 Christians were freed from captivity. 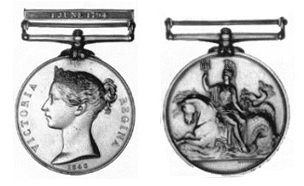 In 1847 the Admiralty decided reward the survivors of Algiers by issuing the Naval General Service Medal with clasp, “Algiers”. Edward Bransfield was among the 1,328 to receive the Medal. One wonders if Edward Bransfield ever reflected on the irony of, he being instrumental in freeing slaves when he and most likely most of his fellow sailors were themselves not much more than slaves being the victims of the press gang. The Royal Navy was left with thousands of unemployed officers when the war with Napoleon ended in 1815. While the rank and file seamen were thrown back onto the streets and quaysides, the officers were retained on half-pay with little prospect of a posting or promotion. Only a fraction of the navy’s 700 qualified Masters were on active duty. However Bransfield’s urged the Navy to send him aboard to test his theories as a navigator. In September 1817, Edward Bransfield was recalled to sea service and appointed Master aboard HMS Andromache a 38 gun frigate. She sailed for Portsmouth to be fitted out for foreign service, her destination being Brazil and then around Cape Horn to Valparaiso Chile. The mission of HMS Andromache was to protect British vessels along the Pacific Coast of Chile and Peru. At that time the emerging countries of Chile and Peru were engaged in a struggle to achieve independence from their Spanish rulers. Britain’s interests were in gaining whatever spoils that they could accrue from the collapse of the Spanish regime in South America. While the orders to Captain Shirreff were explicitly not to take sides in the dispute, Britain was anxious to see its old foe Spain defeated for selfish political and business. Little was Edward to know that his appointment was to be his date with destiny. 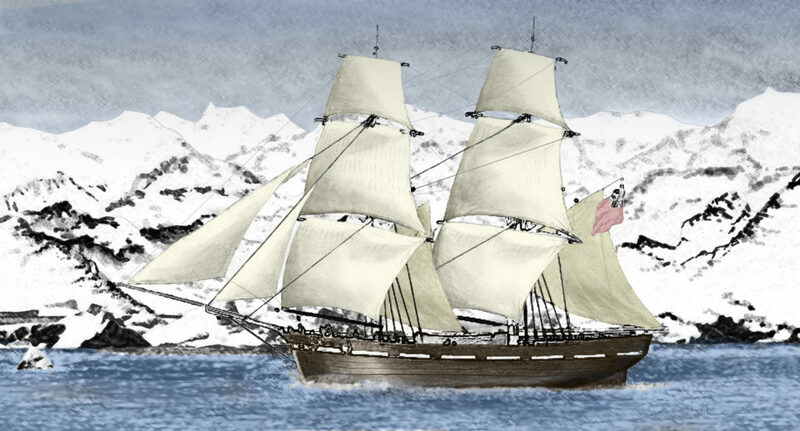 The arrival of the merchant brig Williams into Valparaiso in December 1819 commenced a chain of events that was to quickly lead to Edward being given his first naval command. The tales told by William Smith, captain of the merchant vessel, Williams of an unknown island chain south of Cape Horn prompted his Captain Shirreff to promote Edward to the position of commander of an impromptu expedition of only on ship with orders to seek out the veracity of this previously uncharted landmass. Edwards devotion to duty and leadership into uncharted and dangerous waters was to lead him to become the first person to see and chart the Antarctic mainland, the fabled, Terra Incognita Australis.